Planning an RV camping trip and need to tow your Jeep Wrangler JL behind for an additional vehicle. The RV kicks up rocks and debris that can cause damage to the front end of your Jeep. 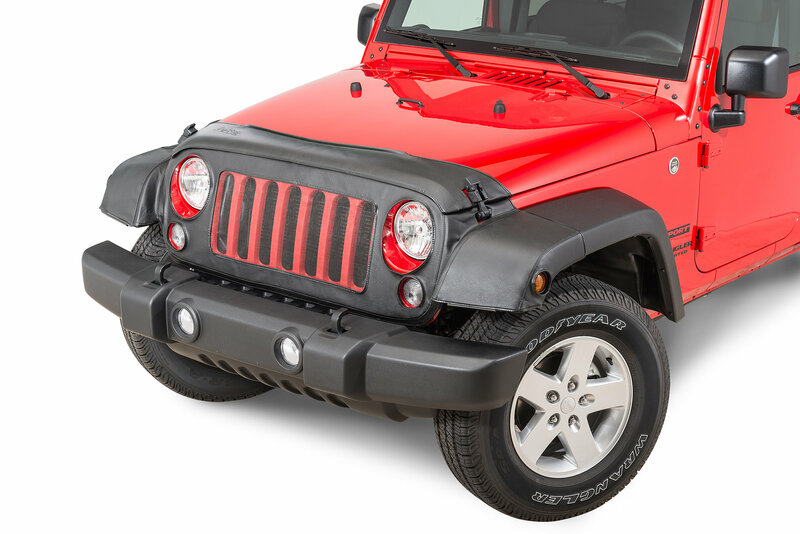 You will want to protect the grille and hood with the Lebra Premium Nose Bra by Covercraft. Made from a heavy duty leather grain vinyl for lasting durability. Offering a 2 piece design allowing access under your hood for vehicle maintenance. Clips and straps provide for a quick installation and easily removable for cleaning. Available in black with a 1 year limited warranty. Quality protection: Made from a leather grain vinyl with a mesh screen covering the grille for optimal protection. Light Provisions: Offering reinforced openings for your headlights, parking lights and side marker lights. Custom Design: Engineered to fit your Wrangler JL front clip with ease.